The second season three episode of Once Upon a Time brought back a few familiar elements. Most notably we got some flashbacks to their past lives in Fairytale Land. I was glad to see that, because that element is one of the things that make the show unique. I was glad to see a return of the dwarves and of Giancarlo Esposito as the genie. While I wasn’t entirely gripped by the first half of the episode, I thought it ended up pretty good. They have introduced some interesting new storylines. My favorite thing about this season so far is that Peter Pan (Robbie Kay) is a villain. I mentioned in my review last week that Peter Pan comes across as kind of a self-centered jerk in the 1953 Disney film. Once Upon a Time has really played up those more negative character traits. The question is will they follow through, or will he be portrayed as misunderstood or something like that? But right now he is pretty bad, having abducted Henry (Jared S. Gilmore – who didn’t actually appear in this episode). The other element I like is an exploration of Emma (Jennifer Morrison) as a person outside of the events of this show. I’m glad they are not having all the pieces fall into place just because she found her parents. 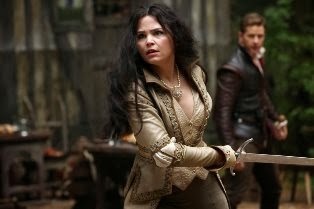 I find it incredibly awkward when Snow (Ginnifer Goodwin) and Charming (Josh Dallas) try to act parental, so I think it’s good they are going in a more conflicted direction. Emma was forced to admit that she has more in common with Peter and his Lost Boys than with the family she has recently discovered. While everyone else is looking for Henry, Rumplestiltskin (Robert Carlyle) was doing some soul searching of his own. I’m not really sure where they are going with it, but we did get some cool little scenes both in flashback sequences and on the island. My favorite part was when he dropped the doll his dad had given him over a cliff and a little while later it dropped out of the sky right in front of him. It was a creepy moment that showed Rumplestiltskin has some vulnerability. He also conjured up an image of Belle (Emilie de Ravin) who was not as comforting as he was hoping she would be. It seems to be pointing to Rumplestiltskin having to come to terms with his past, as Emma is doing. What I don’t find interesting is pretty much anything to do with Snow and Charming. I’m getting tired of the whole pure love thing with them. I mean, I don’t mind that they are supposedly meant for each other, but that doesn’t mean there shouldn’t be any conflict. Whenever they do disagree they are all lovey-dovey about a minute later. It’s boring. And lastly, I hope they find something more for Regina (Lana Parrilla) to do. She’s just kind of tagging along with them as they search for Henry. Yes, she screwed up Emma’s quest by using magic, but it didn’t end up being a big deal. She doesn’t seem to have much of story so far, so I hope they find more for her to do soon. Overall, I think this show is off to a decent start. It seems to be brewing some interesting storylines that I’m looking forward to seeing where they go with. Next week we meet Tinkerbell. I wonder if she will be as nasty as Peter Pan.